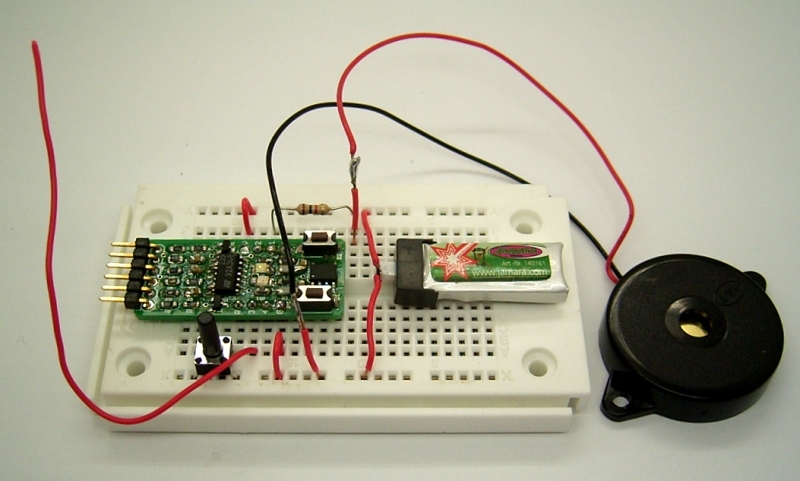 Using a given microcontroller system my question was: How can I make the simplest possible RF receiver. I am using the ATtiny13 on the Sparrow board. LED2 is connected to port B.3 which is ADC(3) as well. So why not connect an Antenna here. The LED should work as a detector diode. A bias voltage is needed. So I should switch on the internal pullup. Now it works fine! Don’t believe it? Watch the video. To get it sensitive enough I had to use one more trick. I switch on the pullup for a very short time. This will charge the LED which is also a little capacitor of only a few picofarads. Voltage may rise up to 2 V. Then I switch back to high Z. The LED is discharged down to about 1.5 V after some microseconds. But in the presence of an RF signal is will discharge a little lower. 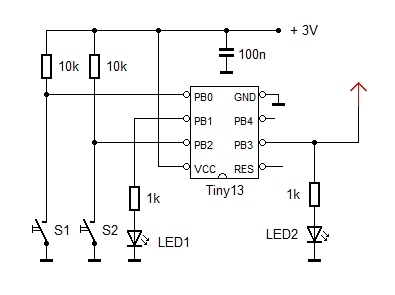 Several RF pulses may result in an integrated loss of LED voltage. That’s why I call it an integrating RF detector. In the end I need something like 50 mV at 100 kHz the get a clear result. I used an integration time of 10 µs. At the beginning I collect a reference value Ref to know the LED voltage without signal. This is used later to detect the voltage loss caused by an RF signal.